For National Day of Prayer the Washington Post is featuring a wonderful group of videos titles "How to pray like..." Leaders from different faiths demonstrate how they pray. Below is the description and the translation of the Sikh prayer. Sikh priest Surinder Singh says the first step to praying is to surrender the ego. 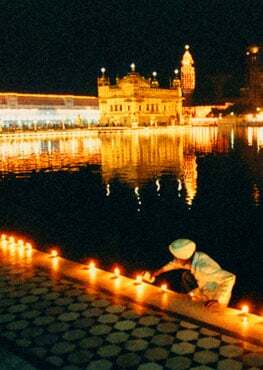 "In Sikhism praying means connecting our soul to the Divine Light. So a Sikh prays before our holy scriptures Siri Guru Granth Sahib ji which guides us to pray to One Supreme Being. So whenever we have to put a request to someone we respect we always stand up. Folding our hands is a tradition of India. From olden times whenever someone needed to make a request they always folded their hands as a sign of humility. By closing our eyes, our mind does not wander around. If our eyes are open, it'll be thinking about ten other things, our kids, our family, this and that, other worldly things. By bowing down we are surrendering ourselves completely to our Guru. Letting our Guru know that whatever comes to our fate, we will accept. I advise somebody who wants to start praying to come with their mind totally surrendered and free of ego. He or she should only ask for the virtues from God because worldly desires come to us when we are connected to God."